Mighty Healthy recruits it’s skateboarding team to show off the brand’s new line of tops and bottoms for their Fall lookbook. Pete Eldridge, Connor Champion, Chris Coulburn and Alex Corporan can be seen sporting Mighty Healthy’s t-shirts, hoodies, and denim as they skate through Queens and L.E.S. Park. Visit mightyhealthynyc.com for buying info. Starring Danny Trejo, Charlie Sheen, Michelle Rodriguez, Jessica Alba and more. New York brands, SSUR and Mighty Healthy, have joined forces for an exclusive capsule collection consisting of four caps, four T-shirts, and three tank tops. The capsule collection will be influenced by both brand’s style and won’t be too overpowering from either. The collection is out now and available straight from ssur. Givenchy designer Riccardo Tisci presents a baseball print crewneck sweater as part the new Givenchy Fall/Winter 2013 collection. This particular piece draws inspiration from the great sport of American baseball as you can see with the details. The sleeves and back portion of this sweatshirt feature graphics of baseball from the intertwined leather straps and tassels to the stitching of the ball. You can purchase the sweater now from MR PORTER. From donning a button up post coitus in a bit of faux modesty, to out and out stealing a boyfriend’s vintage And Justice For All tour shirt — men’s clothing often finds its way onto the backs of women. This has happened since the invention of clothing, as a concept. Grace Jones did it on that one album cover to look unequivocally fierce. Joan of Arc did it because Jesus told her to (he’s a freak like that); and the god of mischief, Amanda Bynes, did it in She’s The Man; to get a man. This lookbook styles МИШКА’s Summer ’13 Collection for women. The clothing is more than just the typical streetwear fare — it’s not just for boys who skate. It appeals to everyone who seeks out unusual, challenging and exciting pieces. This is the story of women taking clothes that may seem like it’s not for them — and they are making it their own. This lookbook appeals to the creativity women are constantly showing through their use of Tumblr and other forms of New Media. 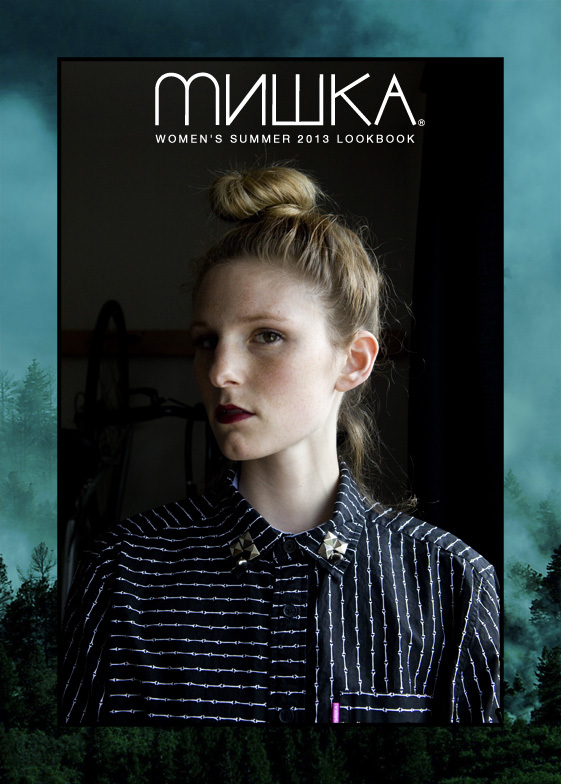 The collection is presented as a DIY fashion zine created by the women featured in the lookbook.